December 11, 2015, 12:22 PM · Christian Howes was 16 when, after studying violin for more than 10 years, he decided to join a rock band. That's also when he made a startling discovery: Despite his comparatively long years of study, he found himself behind his peers, in certain ways. "The rock musicians knew things about music that I didn't," Howes said. They seemed to know how music was put together, and they had a strong knowledge of chords. "It was amazing to me, there was this whole other knowledge base and skill set." This opened a whole new world of possibility to Howes, and he's been exploring it ever since. 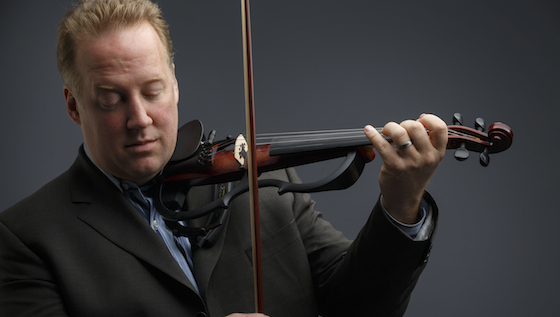 In fact, he's made it his life's mission to share that world through his Creative Strings initiative, which has evolved over 15 years with the mission of transforming music education, offering outreach, online curriculum, and an annual summer conference. 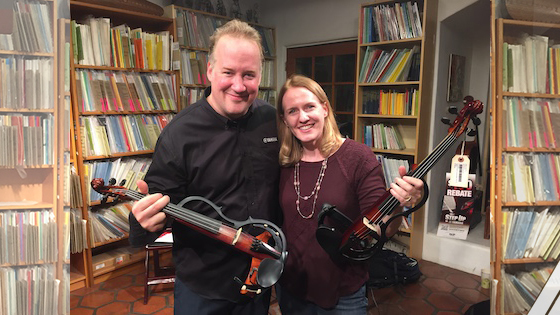 I caught up to Howes last month, when he gave an improvisation workshop at Metzler Violin Shop. An expert in jazz and electric violin who is also classically trained, Howes said that he has struggled with his identity as a violinist. The "classical" people didn't seem to think he was serious enough, and the "rock" people questioned whether the instrument belonged. As a result, he made it a point to try to become an expert at all the genres that he could, especially jazz and improv. His improvisation on Bach's G minor fugue (below) begged the question: What would Bach have done with this kind of technology? What Howes did was fascinating; he turned the fugue inside-out. A fugue generally starts with a musical "subject"; Howes started with everything but the subject -- the inner voices, the bass line, a little improv -- and only revealed the subject toward the end. Howes recently released a new album, American Spirit, which has more of his compositions and improvisations. If you play a note in the chord, it will always sound good. "People think that improvisation is magic, and it's intuition -- it's not," Howes said. "It's like simple math, it's drag and drop." To that end, we did a very basic exercise: we improvised to the (in)famous Pachelbel canon chords. To drive home his point, he'd made us a little cheat sheet (see below). "For every chord, I've simply stacked up the notes in the chord, so all you have to do is look at it and choose a note, and it will sound good." Place chord tones on the downbeat of the chord, and non-chord tones elsewhere. One doesn't always want to play only the notes in the chords, but non-chord notes can sound out-of-place. One easy guideline is to place the chord tones on the downbeat of the chord, and the non-chord tones elsewhere. As the listener, "we hear the consonance, and that tells us that the world is okay." But in between? You can pretty much do whatever you'd like to do, as long as you get back to that consonance with the chord tone at the right time. Do all improvisers do this, all the time? No. "This is a strategy, a trick -- but not a rule," Howes said. It's hard to do this, yes, "but it's also hard to learn to read," Howes said. "It's memorization, internalization -- and it's something anyone can do." Accomplished classical musicians often give up on this skill, or they think they should be able to do it with more ease. But know this: it's okay if you aren't good at it at first, and it's okay if you initially get frustrated. Just as gaining fluency in reading words and reading music took time, fluency in chords takes time as well. Know ALL the chord tones, for voice-leading. It's not enough to know the chord tones, you have to be able to call up nearby chord tones so that you can do voice leading. Howes used those "Kanon Chords" to introduce rhythmic patterns and hooks from various genres: rock, waltz, bluegrass, reggae, bossa, samba, and swing. It's amazing, how you can make pretty much any chord pattern into a different kind of genre, but you have to know the language. As violinists, we have a lot of tricks up our sleeves already, but the electric violin and loop pedal enlarge the possibilities even further. Some of the ideas he introduced to us were: ghosting, chopping, soft pizzicato, loop pedal and other special sound effects. Howes plays on a Yamaha SV-250 4 String Electric Violin and he has been an official spokesperson for the brand for some 20 years, since the Silent Violin was launched in 1996. For those interested in buying an electric violin, Howes highly recommended the Electric Violin Shop for their service and ability to answer questions. Also, during this season, Howes is doing some giveaways, including a download of his composition, Postlude, which is inspired by Bach's Preludio from the first partita. In conclusion, the best way to get good at improvising is to start learning, keep learning, and practice. Also, become aware of your own playing. "The single best way you can improve is to record yourself," Howes said. "Without awareness, you can't change what you do." December 12, 2015 at 01:56 PM · I too discovered this when I got involved in Irish and English fiddle music some years ago, and my violin teacher later acquainted me with Eastern European folk music. All good eye-openers.